A Secret Rose is designed to be performed on a standard proscenium stage. Rhys Chatham and his production team come to the city of the performance with a bass player and drummer and teach the music of A Secret Rose to 100 locally recruited electric guitarists. 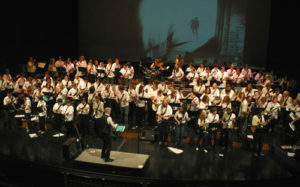 The music is taught over three days, culminating in a performance.